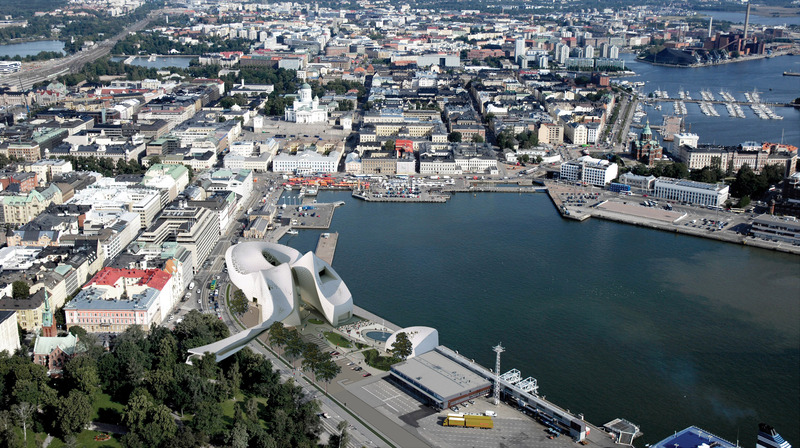 Our proposal for the Guggenheim Helsinki creates a new relationship between art and the city of Helsinki. Hovering over the ground, our museum creates a new urban space and art park with a multitude of public spaces at the edge of the Gulf of Finland. 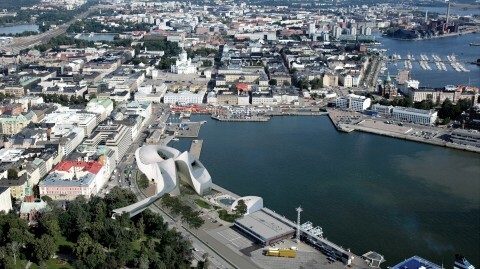 The building postures itself at the end of Eteläinen Makasiinkatu and frames a view to the harbor. 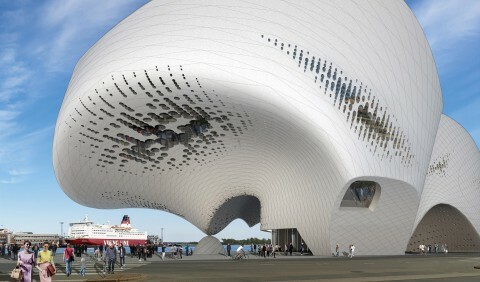 As an iconic figure, the museum changes as one views it from the city, the park, the street, or the water. An inner street that ends in a courtyard and covered plaza parallels a renewed pedestrian path along the water’s edge, providing connections to the city while a new pedestrian bridge connects to the park beyond. The Northern face of the building cantilevers over the city, creating an iconic entry to invite visitors towards the inner courtyard & museum lobby. 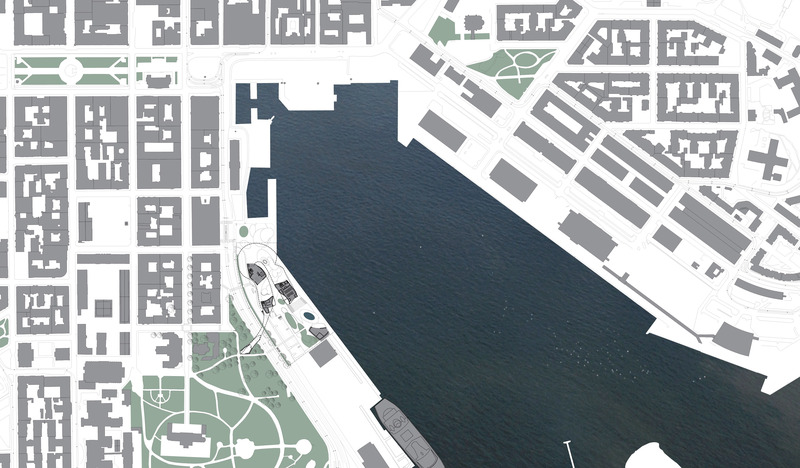 Part landscape and part urbanscape, an activated urban frontage recreates the water’s edge and reconnects the City to the water. 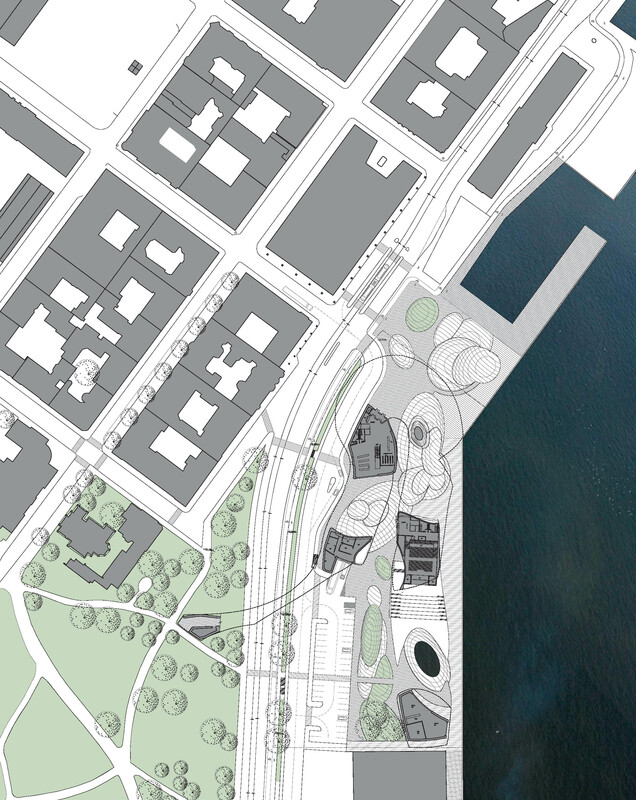 Public amenities – including cafes, a design store, a black box theater, and an outdoor amphitheater – are interspersed throughout the outdoor exhibits in the art park, and create a new living room for the museum and the city at the edge of the South Harbor. Mediating between the scale of the harbor and the scale of the city, the Helsinki Guggenheim creates an unexpected waterfront place that will be a new nexus for the city. 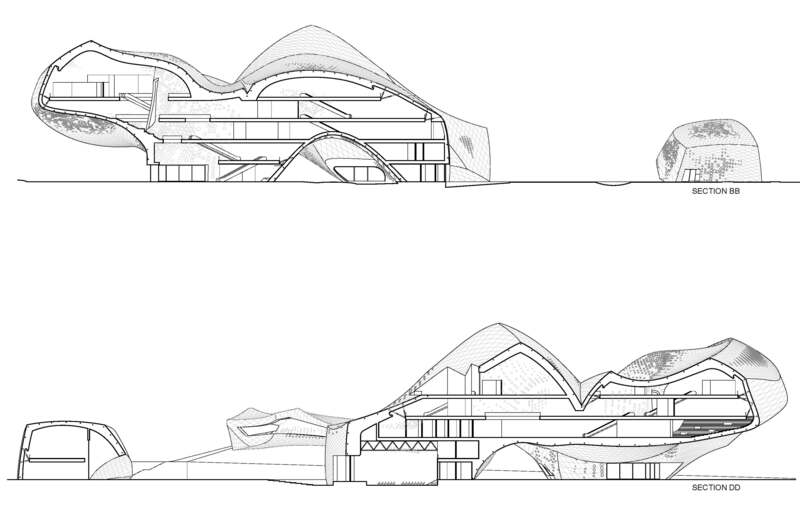 Varying perceptions make a nuanced, landmark project. 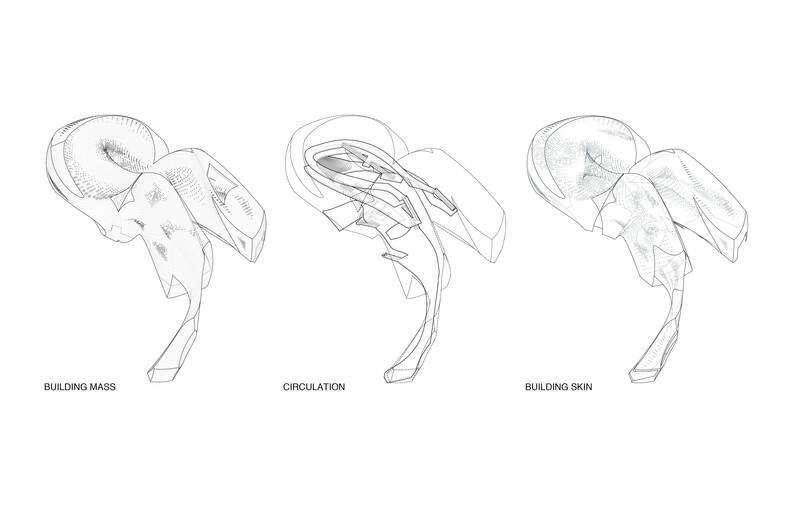 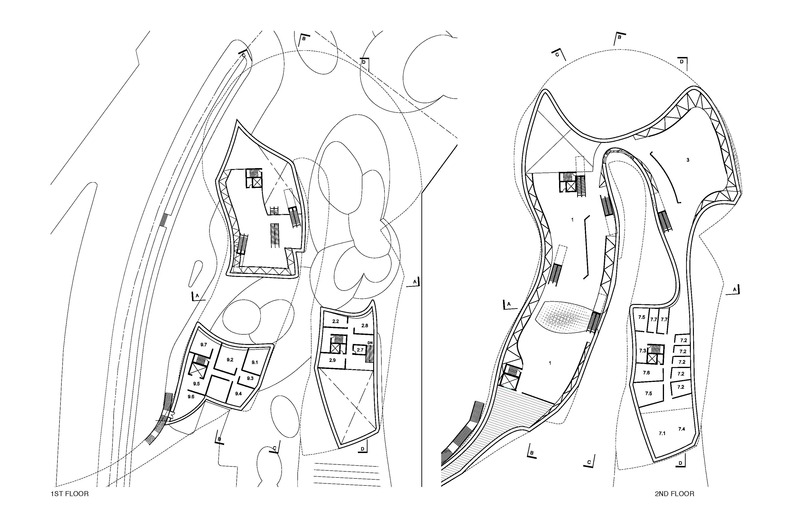 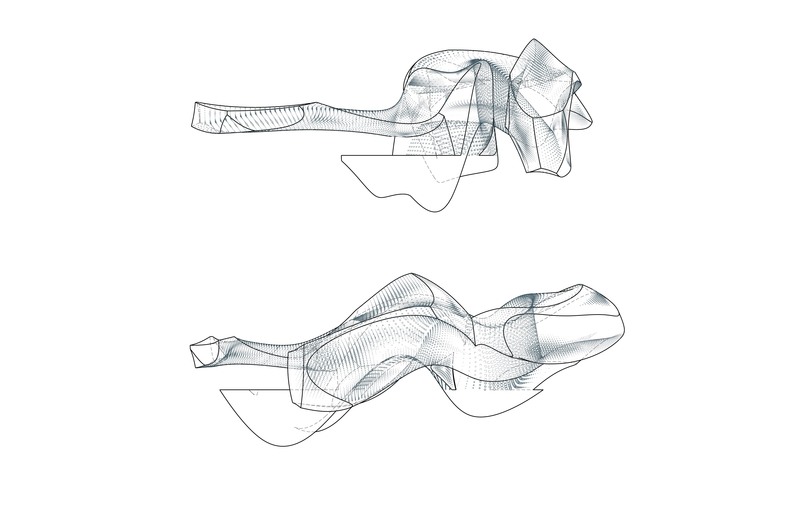 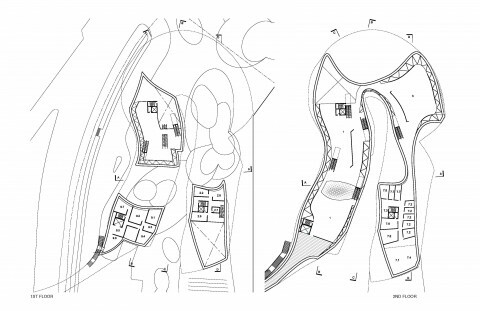 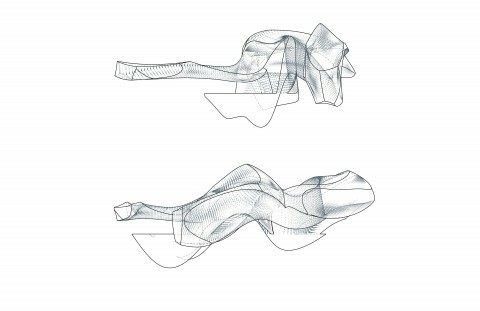 The composite form of our project arrives through hybridizing an emergent geometry and a Boolean geometry. 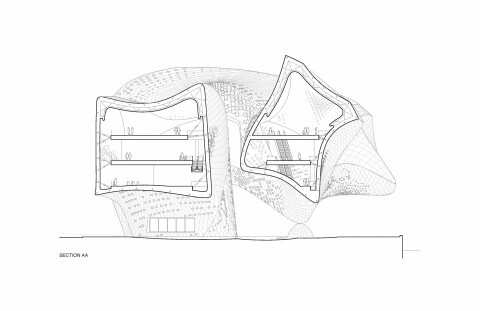 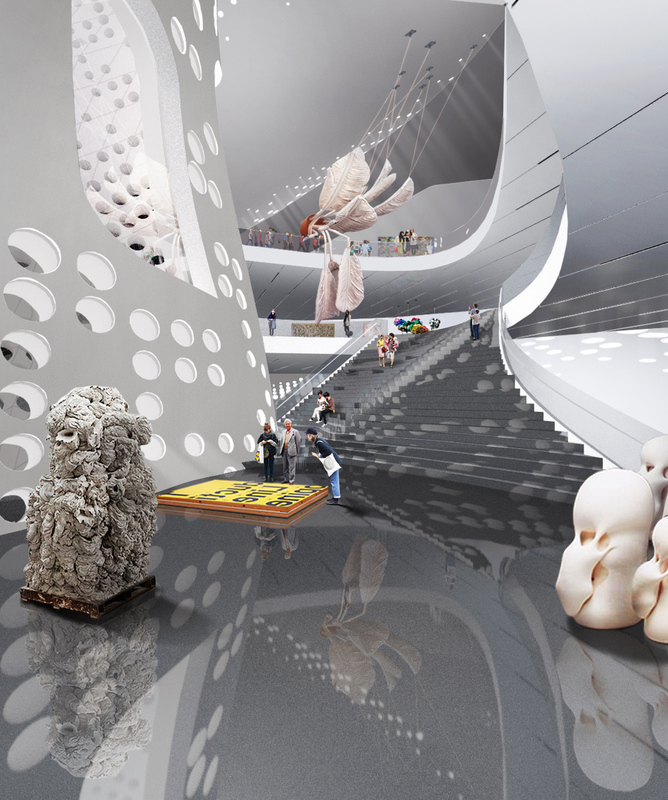 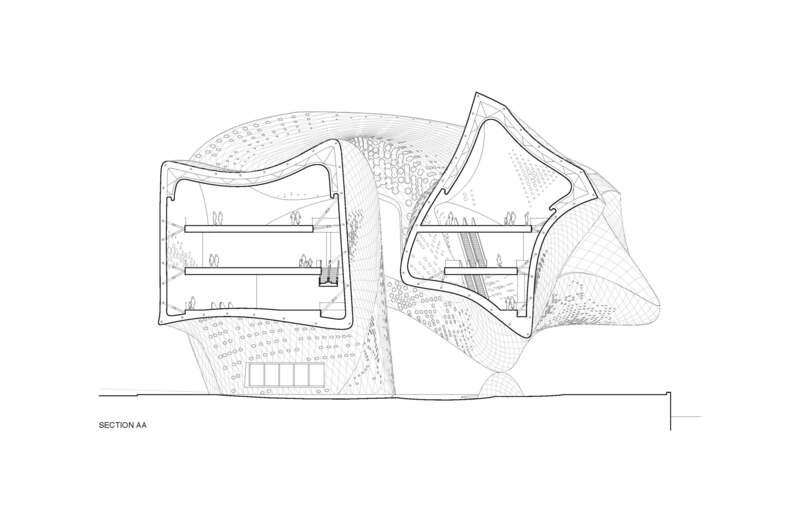 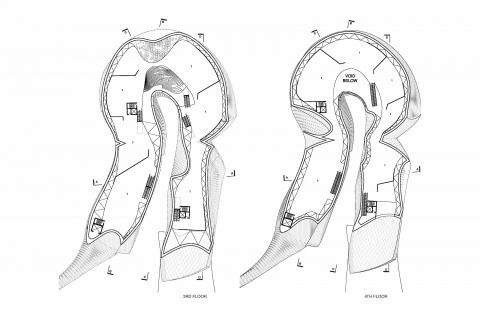 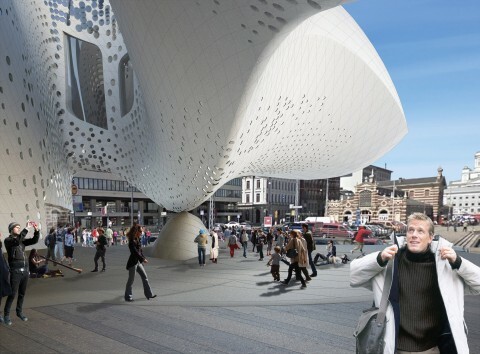 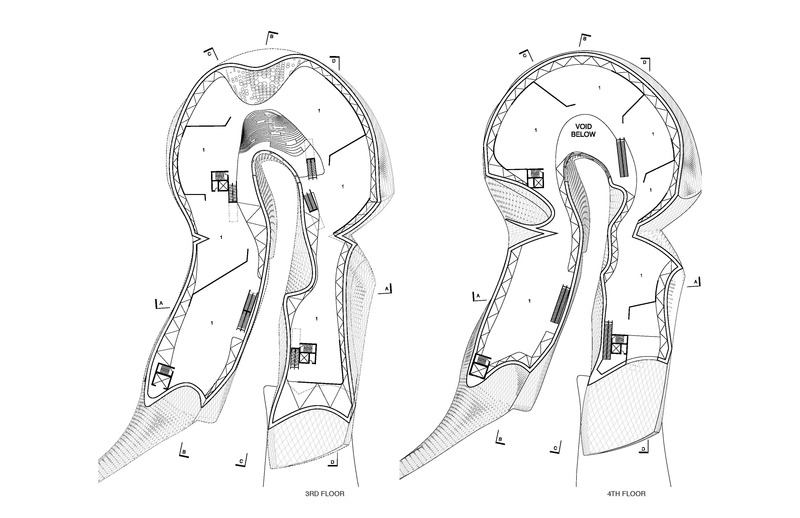 Substantially supported by a structural exoskeleton, this proposal provides ultimate flexibility with column-free galleries with controlled environments. The primary galleries are on the 3rd through the 5th floors and allow for both linear and non-linear curation techniques. 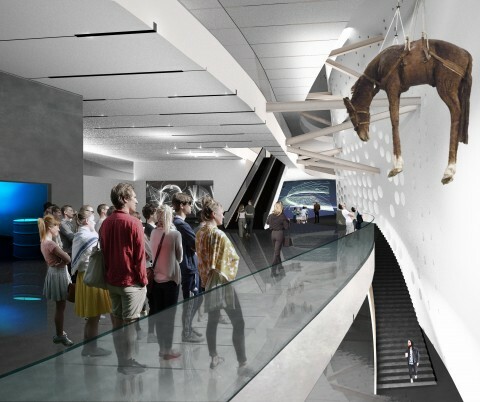 The museum galleries are organized as a series of loops that create a variety of gallery sizes and configurations. 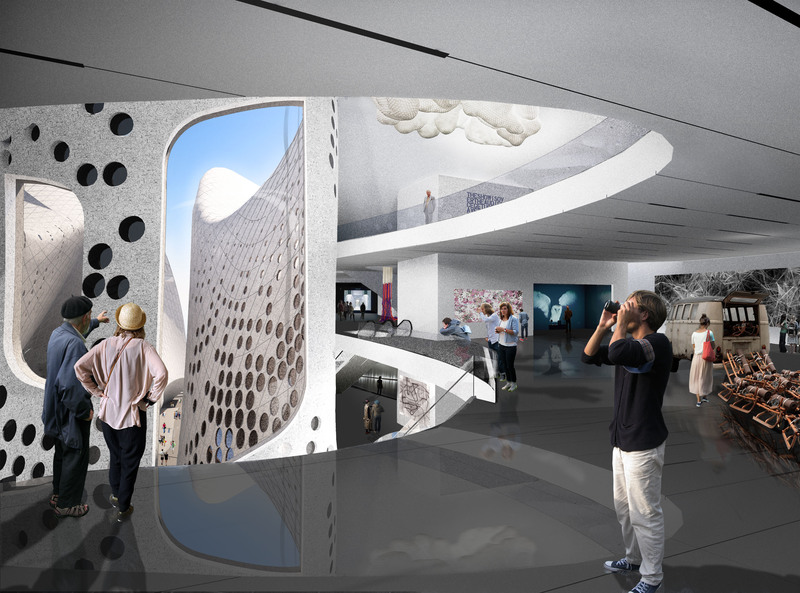 Circulation through escalators and stairs leads visitors through the three-story lobby at the ground floor to a mezzanine on the second floor. Here two escalators take visitors to a large third floor gallery and the large flexibly organized multi-purpose room. Levels four and five contain the bulk of the museum galleries of varying sizes, all connected through a series of open spaces that facilitate movement and collect around a “u” shaped exterior courtyard that filters light into the museum circulation areas.